The Lunney House Museum in the City of Seneca at 211 West South First Street, is an American Queen Anne style bungalow built in 1909 with an Arts and Crafts interior and Carriage house. Pinnacle Web Design launched this web site in October, 2011. This site is based on the vision of the Director and Curator, Dr. John Martin. It is a Pictorial journey through the Architecture, History and the Gala Events that are held there. We are also creating, with Dr. Martin, a site for the Bertha Lee Strickland Cultural Museum. Both sites will accept donations using PayPal. It has been a pleasure to work with this incredible man. Site created by Pinnacle Web Design. We have many fine restaurants for all tastes and price ranges in and around Seneca. See the list maintained by the Oconee Chamber of Commerce or this Google Search result page. The Clemson Chamber, which includes Clemson and Pendleton, also has a list. You can also call us for our favorites! We have three waterfront restaurants you can go to by boat or car: The Lighthouse, The Cliffs Vineyard Lakehouse (open to the public) and Tiki Hut at Keowee Marina. On downtown Seneca's Historic Ram Cat Alley are Circa 1930 for fine dining and the award-winning sports bar and restaurant Spot on the Alley. In nearby Clemson is The Blue Heron. The Lighthouse Restaurant. Welcome to The Lighthouse Restaurant. Lighthouse is Lake Keowee's premiere dining and leisure experience. We have casual fireside dining on the main level and upscale casual on the second floor with panoramic lake and mountain views from every table. Outdoor seating is available on our spacious porches and decks, and we also offer take-out, catering, and meeting rooms. You can come by boat or car, and we'll be here to greet you with a smile and to make you feel comfortable. Lake Keowee Marina and Boat Rentals & The Tiki Hut Lakeside Grill. Conveniently located on beautiful Lake Keowee off Highway 123, in Seneca, South Carolina. Nestled in a beautiful blue water cove, Lake Keowee Marina will turn every visit into a vacation. Every boat in the marina is a short walk from our dockside, paved parking areas. Quick access to the big water means more time for water skiing or the excitement of cruising on your personal watercraft. The New Rental Pontoons Are Here! The Tiki Hut offers lakeside dining and live entertainment. Dock your boat at the star dock, have lunch, and refuel at the marina. The web site says it is a private club, but this applies only to the bar. Anyone can come for lunch or dinner. The Happy Berry. The 17.5 acre Happy Berry farm is located on the eastern shore of Lake Keowee in Pickens County, South Carolina. It is a fun and lovely experience. It is a pick-your-own small fruit farm with blackberries, blueberries, grapes, figs and elderberries. Pre-picked berries and SC fresh fruit and vegetables from local farmers are available. As you enter the farm you drive past rows of blueberry bushes and see the old tenant house used as headquarters for the farm. The house site has been there since before the mid 1800s but has burned down at least once. The house was rebuilt sometime prior to 1937. Resident chickens will greet you. Oh yes, they will share their eggs with you. Tour groups welcome. Upstate Food Co-op. As a responsible member-owned and operated food cooperative of the local community, the nation and the world at large, Upstate Food Co-op is a crossroads of shared nutritional knowledge and a purveyor for its member households as a source of wholesome foods and closely related products at the lowest feasible price. Specializing in organic, natural, and allergy-specific foods and supplements. Local fresh organic vegetables. Check web site for map and hours. We suggest calling before going. Great place and great prices. Leopard Forest Coffee Company. Travelers Rest, SC (minutes from Greenville on the way up to the mountains) has one of our favorite coffee shops. Don't miss it. Bring a friend. The wonderful ambiance includes 100 pound bags of beans, soft sofas, Wi-Fi, interesting music and billowing silk drapings hanging from the ceiling. From the Leopard's mouth; "As always, our goal is to be the best coffee shop in the Greenville area. We are renewing our coffee focus, and also responding to increased customer interest in tea by scouring the world for the best and most unique teas. Our top three Baristas have been trained with the Specialty Coffee Association of America, and they oversee the training and performance of our other baristas." The awesome menu offers sandwiches with fresh baked breads, daily soups, salads, fine cakes and specialty chocolates. PS great "coffee" table books too. You can purchase their coffees through their web site. Thaicoon® Ricefire® & Sushi Bar offers a unique full service restaurant and full bar, serving high-quality Thai cuisine and sushi moderately priced, in a friendly, harmonious atmosphere seven days a week. An "official hangout" for Furman students an their folks. Most definitely a hangout for the Agent fam as well. A proud sponsor of Furman University athletics Just a few minutes from downtown Greenville! Located in the University Square shopping center, near Furman Univeristy. Menus on line. The Coffee Underground. Unique Cafe, Cozy & Friendly Atmosphere. CU Theater Room, acoustic artists to poetry. Freshly roasted coffees, all day menu. The perfect place to meet with colleagues and friends, or to find a nook for studying. Become inspired by the various performances in the CU Theater Room, from acoustic artists, to poetry open mikes and slams, and movie discussion groups. Featuring freshly roasted coffees, lattes, hot teas, frappes, milkshakes & fruit smoothies. Beer, wine, liquors & cocktails. Breakfast items such as pastries, bagels & egg items. All-day food menu offering sandwiches, wraps, salads, soups & quiche. Homemade Desserts such as strawberry cake, cheesecakes, pies & tiramisu. The mission of Whole Foods is, “To provide a more natural food alternative than what most supermarkets were offering.” That is certainly still true. Their customer service that several orders of magnitude better than what we see elsewhere. You can actually get help when you need it! Hagood Mill Historic Site & Folk Life Center, Pickens, SC. About three miles north of downtown Pickens off Hwy 178 on Hagood Mill Road. Built in 1845, Hagood Mill is one of the oldest known surviving gristmills still producing grain products (flour, cornmeal and grits) in South Carolina. The site is home to a restored pioneer village with live demonstrations of quilting, spinning, carving, blacksmithing, flint-knapping and many other traditional arts and living histories a working blacksmith shop. The Mill is open every 3rd Saturday. Free admission. Keowee Sailing Club. The club was formed in 1972, and is located on Highway 130, two miles north of US 123 in Seneca, SC on one of the most beautiful lakes in the Southeast. Our launch ramp allows launching of most trailerable boats, with a mast stepping pole in the adjacent parking area. We have slips for over 130 sailboats, and a large parking area for trailerable boats that are drysailed. Issaquena Falls & Stumphouse Tunnel. This is one of our favorite waterfalls. You can see other photos on our Lifestyle Photos page. It is stunning! The City of Walhalla maintains this area as a park. This impressive waterfall is a short walk from the parking/picnic area. Located in the same park as Issaquena Falls, Stumphouse Tunnel was partially cut in 1858 as a rail tunnel, but the Civil War ended the project. Clemson University has used it to age cheese. Bring a good flashlight and a hat. Don't come too late; the park closes at 5:00. Falls Park on the Reedy. Long before white settlers arrived, the Cherokee lived and hunted at present-day Greenville. In 1852, Furman Institution (now Furman University) bought the land. Three textile mills and a cotton warehouse operated in the early 1900s, now contributing to the historic district with shops, a Hampton Inn, Starbucks and fine restaurants of the Reedy River Falls Park area. Carolina Foothills Garden Club reclaimed 26 acres for the current park years ago. The City won an International Award for Liberty Bridge; it is stunning. Here are a few extra important events at the Falls; Reedy River Duck Race, Upstate Shakespeare Festival, Jazz Festival, Christmas Tree Lighting, US Pro Cycling Championships and the Red, White and Blue Festival great family fun and culture. our Greenville Gallery has more photos of the park. Kingfisher Maps. Since 1970, Kingfisher has produced lake maps for boating, fishing and recreation on many of America's hottest lakes. To the left is a map that provides the locations of Lake Keowee subdivisions. Click the map to visit their online catalog. Visit our Lake Keowee Custom Home Builders page. Are you thinking of building a custom home on or near Lake Keowee? 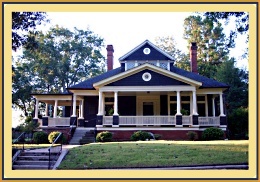 We have several excellent custom home builders in our area. We work very closely with them to help determine which land is right for you and your new home. Together we will walk your potential land and will examine the topography which will determine the location of home site, placement of the driveway and septic. It is important to us that you have a, “fine building experience.” Visit our Keowee Custom Builder page for Custom Home Plans by Southern Living®, Frank Betz, Stephen Fuller, Donald Garner, and Johnston Design Group. Blue Moon offers professional estate sale services to families and individuals in Anderson, Clemson, Seneca and surrounding areas of South Carolina. Whether you are liquidating the assets of a loved one or simply downsizing your own property, let us help make your estate sale a complete success. Willow Oak Landscapes provides a comprehensive range of residential and commercial landscape and land services to property managers, developers and homeowners. Our services include landscape design, installation and maintenance, hardscapes, landscape lighting, erosion control, irrigation, consulting and water features. Site created by Pinnacle Web Design. 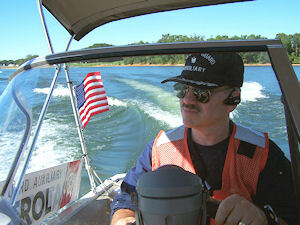 U. S. Coast Guard Auxiliary Flotilla 25 - America's Volunteer Lifesavers.SM The Pattersons have been involved with the Auxiliary on Lakes Hartwell and Keowee since 2001. The Coast Guard Auxiliary is a uniformed volunteer organization chartered by Congress in 1939 to promote boating safety and to assist the Coast Guard in the performance of most of its missions. We perform Vessel Safety Checks, hold classes, and patrol the lakes helping boaters. Flotilla 25 serves Lake Keowee and Lake Hartwell. We are the only Coast Guard presence in this area. Doug has been a member of the Coast Guard Auxiliary since 2000 and has been served as the commander and vice commander. Carol is also an active member! We are always looking for new members who want to help us promote safe boating on our lakes. Come to one of our monthly meetings to learn more. The schedule is on the web site. Call Doug to schedule a free Coast Guard Auxiliary Vessel Safety Check to help you be sure you have all the equipment required to be safe on the water. You never know when you might break down and be stuck on the lake overnight. Having your lights working might just save your life! Doug also teaches safe boating classes to equip boaters with skills and knowledge that will help them operate their boats safely. 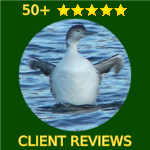 Completing one of these classes may qualify boat owners for an insurance discount! 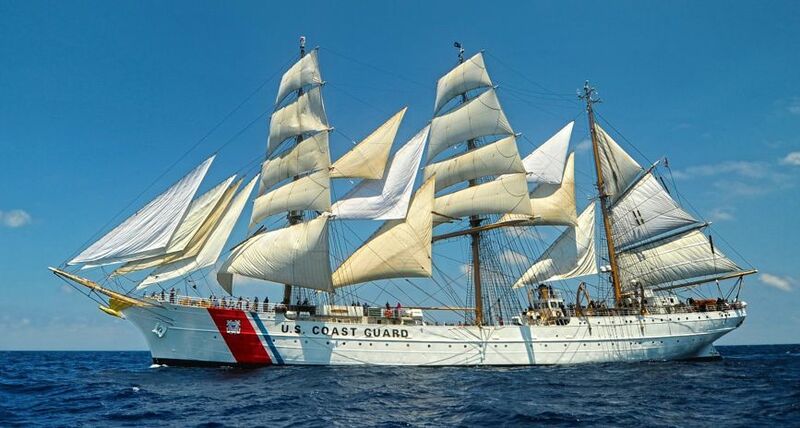 Click the photo of the Coast Guard Cutter Eagle above for a larger photo of the Eagle under full sail. The Eagle is the training ship of the U.S. Coast Guard Academy in New London, Connecticut. Doug spent six weeks aboard the Eagle on training cruises as an Academy cadet to Europe and the Carribean. Friends of Lake Keowee Society (FOLKS). The Pattersons are active members in FOLKS and enjoy the fellowship and good work they do. Established in 1993, FOLKS exists, “To preserve, protect and enhance Lake Keowee and its watershed through conservation, science, education, and good governance, so that the lake remains clean, safe and beautiful for the community, users, visitors, area businesses and future generations.” They work to preserve the quality of Lake Keowee through monitoring, clean-up, and education programs. Stay up to date on the latest hot lake topics. Young Appalachian Musicians (YAMs) of Upstate SC. 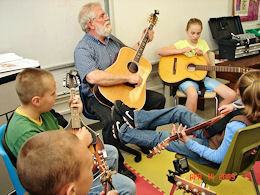 YAM is an after school program using local musicians as instructors. Students are 3rd, 4th & 5th graders from Holly Springs Elementary. YAM introduces children to the traditional music of their heritage. Realizing the need to preserve this vital aspect of mountain culture as well as of positive activities for our youth, local educator, Betty McDaniel, began the program in January, 2008 with thirty two 3rd-5th graders at Holly Springs Elementary. Local traditional musicians teach students to play time-honored music on fiddle, guitar, mandolin, and banjo by ear â€“ the traditional way. Preserving Our Southern Appalachian Music (POSAM), Inc. is the non-profit that supports the YAM program. Greenville-Spartanburg International Airport (GSP) is located in Upstate South Carolina, midway between the cities of Greenville and Spartanburg on I-85 (Exit 57). GSP has grown into one of the finest airports in the country, steadily meeting the Upstate's ever-increasing needs. Clemson-Oconee County Regional Airport (ICAO ID: CEU) serves as the aviation gateway to Upstate South Carolina's most scenic &#8220;Golden Corner&#8221; including three of South Sample Carolina's permier educational institutions (Clemson University, Southern Wesleyan University, and Tri-County Technical College). Visitors will find our friendly, professional service a pleasant alternative to traditional commercial air travel. The airport is less than 1 mile from Lake Hartwell and only 3 miles southeast of Lake Keowee. Not far from I-85, the towns of Seneca, Westminster , Walhalla, and Salem are just a few minutes drive from the aerodrome. The mountain resort towns of Highlands and Cashiers NC are but a short drive from Oconee Regional. Pickens County Airport. 240 Airport Rd., Liberty, SC 29657. Terminal: (864) 843-5803. AWOS: (864) 843-5801. Once you touchdown at Pickens County Airport you'll immediately see why many people say that this is one of the most beautiful airports around.